Description: Smith & Wesson Model 45 four screw double action revolver serial #C429763, 22 S, L, LR, 4" pinned barrel with an excellent bore. Overall the revolver retains 98% of its original factory blue finish with two small areas of scratches on the front, lower right, of the frame and the top upper left of the frame, behind the barrel; a small scuff on the end of the barrel; and scattered scratches and a light turn ring on the cylinder. The revolver is equipped with a set of incorrectly numbered, near excellent condition, diamond center, checkered, magna grips featuring the Smith & Wesson medallions. The grips have a small gouge and a very small chip on the left grip panel. 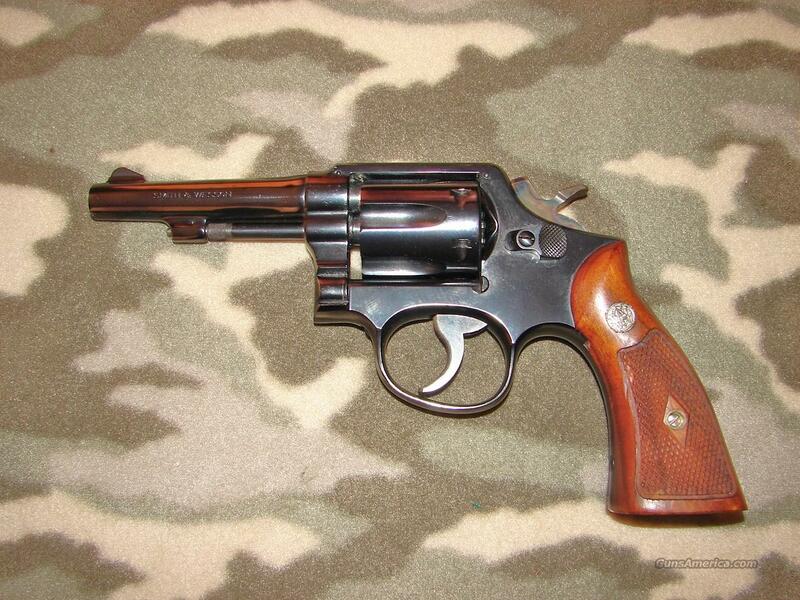 The gun is equipped with fixed front and rear sights and would make a fine addition to a Smith & Wesson collection. There is no box and papers.